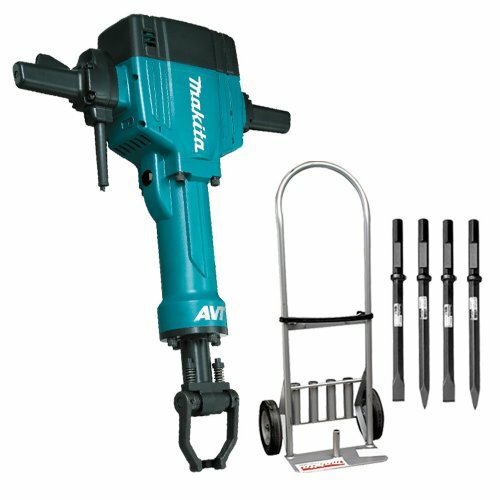 If you need more power than the standard breaker hammer, then is the Makita AVT the way to go? There is one particular breaker hammer that has received a goodly amount of attention as it’s being touted as a hard-hitting power tool designed for heavy-duty use. 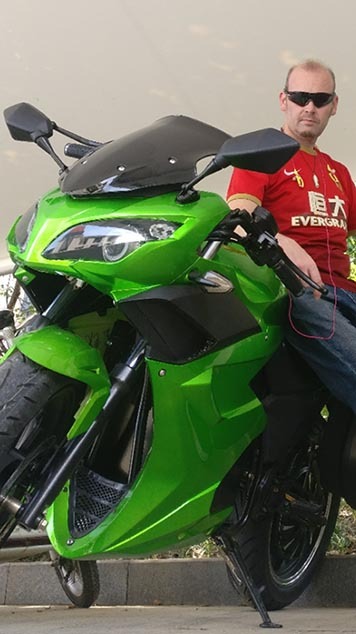 To find out whether it is as good as advertised, we took a closer look at its features and how it really performs. Now let’s dig into the Makita HM1810X3 70-LB AVT breaker hammer review! (phew, say that ten times fast!). The AVT doesn’t make as much noise as other breaker hammers. At just 107 dB, it is the quietest in its class. Break hammers are notorious for their noise, but the Makita has taken care of that here. The Makita AVT performs very well, not surprising, given its specs. The bundled cart is adequate, and the chisels (2 flat and 2 bull point) function well in various applications. Both chisels are heavy duty and won’t dull, even when used for extended periods. There are no major adjustments needed as the chisels are at the proper height. The AVT also doesn’t kick up a lot of dust compared to other breaker hammers, and has very little vibration. Anyone who has previously used a breaker hammer or a jackhammer will appreciate this. 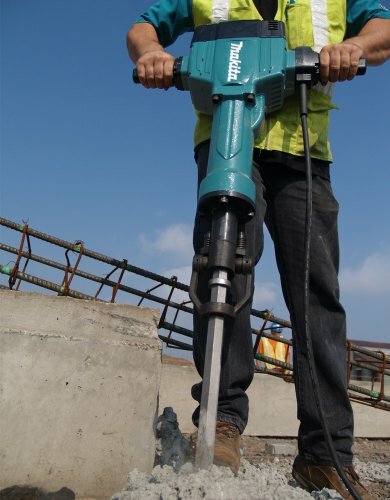 The Makita is a powerful breaker hammer, but it does not bounce around like a typical jackhammer. It has weight yes, but that’s to be expected. The solid weight is also what drives the energy into the target. Whether it’s concrete or rocks, the AVT breaks it up without scattering dust all over the place. This breaker hammer is for heavy duty use, and it’s got enough power to break 6” concrete slabs, and it is very handy for plumbing repair jobs. The inclusion of the chisels is a nice touch and simplifies a lot of the work you have to do. The AVT come with a long, heavy-duty cord; thanks to the cord’s length, you don’t always need to use an extension cord. And because it is heavy duty, you can just focus on your work without worrying about damaging the cord. Buying the Makita AVT is more practical than renting one with this power. Think of this as an investment; the tool is going to pay for itself as you’ll be able to more work in less time and with less effort. The Makita AVT works fine as it is, but there are several attachments you can buy to increase its flexibility. They’re not necessary, but it’s good to know there are options available. If you’re looking for a breaker hammer for breaking up concrete, there are many available, but the AVT has the edge because it is more versatile. With this tool, you can drill, scale and break concrete. It’s also capable of cutting roots, digging hard soil and removing tiles. You don’t need to make any special adjustments as the process works the same no matter what you’re working on. 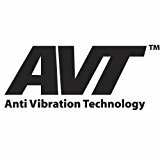 Since the AVT is electric, there is no need for a compressor, and the anti-vibration works as well as advertised. If you have used other breaker hammers before, you will notice the difference with the AVT and the way energy is directed towards the target. If you’re looking for a powerful breaker hammer that doesn’t make too much noise, the Makita AVT could be what you need. It has the right balance of hitting power and ease of use, which is hard to find in these tools. Not everyone needs a powerful breaker hammer, but if you do need one, the AVT is as good as they come. If you have made it this far, you already know its capabilities and why it’s considered a heavy-duty breaker hammer. 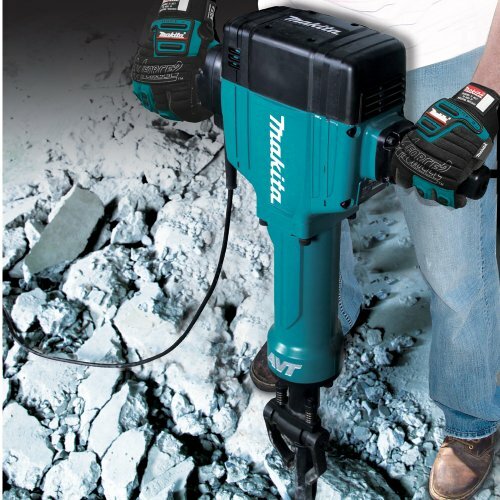 Bottom line: If your work involves breaking up large chunks of bricks, concrete and other materials, you will like the Makita AVT Breaker Hammer.